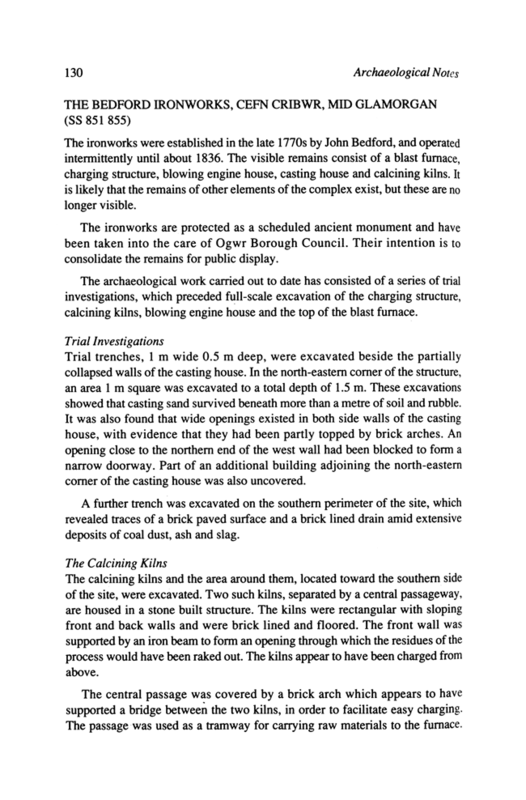 Archaeologists working for Ogwr Borough Council at the Bedford Ironworks, Cefn Cribbwr, Mid Glamorgan, have made some important discoveries recently at what is arguably the best-preserved example of a late 18th – early 19th century ironworks in Britain. 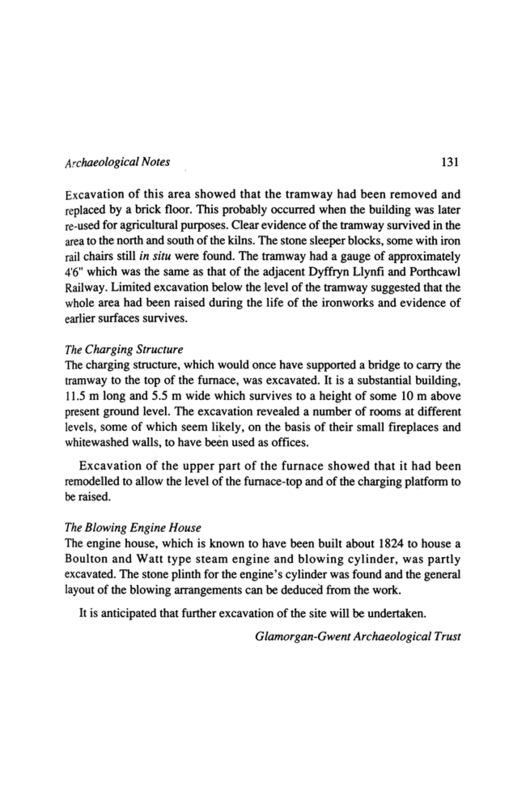 The casting house, where molten iron would have been made into ‘pigs’ is being investigated and signs of the pig-beds with the casting sand have been uncovered. In its final phase, between 1836 and 1852, the works was used as a foundry. Part of the casting-house and another adjacent building were used for this. Lines of stone sleeper blocks have been found leading away from the foundry, these held the rails of a tramway for transporting finished castings and raw materials. As reported in NGN 202, a row of stone sleeper blocks has recently been uncovered at Bedford Ironworks. 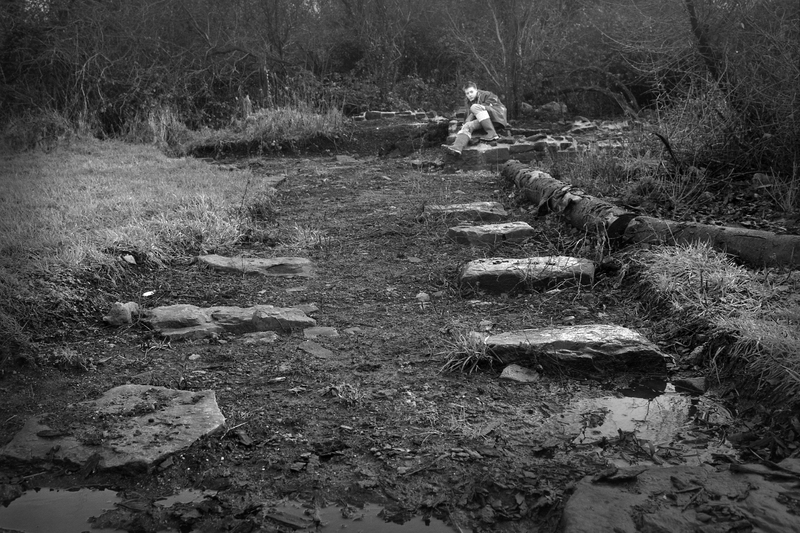 A visit to the site in January confirmed the existence of stone sleeper blocks from an early tramway. This was presumed to be of 4ft 6in gauge and connected to the Llynfi & Porthcawl tramroad. Unfortunately it was impossible to measure accurately as some parts were less than 4ft 6in but other blocks were as much as 6ft apart. The Ironworks is still under restoration and officially not open to the public. One thing you will notice is the spelling of Cefn Cribwr. Over the last decade or so much correction of previously mis-spelled Welsh place names has taken place within the county borough, the double-B which everyone seems to have used for centuries has now been replaced with a single B.
It’s been ten or more years since I last made a visit to the Ironworks and the adjacent Cefn Cribwr brickworks site, I guess a return is long overdue. Interesting post. Where do you stand on the un-anglianising of Welsh place names? I really think it’s rather silly to make up Welsh names for places that have always had an “English” name, but we live with it – can never remember the new names though and I guess the majority of the population in the south east corner of Wales can’t either! Pontycymer is a good case, spelled for centuries with mm it’s now become just one m. As for the street names I always understood Heol y Frenhines should be written just like I’ve just done. It is confusing, my brother-in-law is a Welsh speaker and he’s confused too!